They’ll be riding in comfort and style with the 10+! This rear-mounted child bike seat can be reclined and is equipped with a combination lock security system bracket to prevent theft. The 10+ is the perfect addition for any rider looking to add a (comfy!) little passenger. The 10+ let’s your little passenger enjoy their ride in comfort. 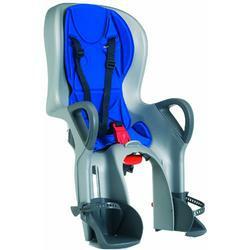 The child bike seat is equipped with a recline system that has ABS (Automatic Barycenter System). With ABS, the 10+ can maintain the center of gravity in the correct position, regardless of the angle of the back seat. The suspension system of the 10+ allows the child to enjoy the bicycle ride with ease and without having to take in the impact of rougher terrain. Thermoformed padding has been strategically placed on the 10+ to give the rider extra cushioning. A combination lock system is installed on the easy mount bracket. This locks the child bike seat in place on the bicycle and will only disengage once the correct combination has been entered. The easy mount bracket system also offers “One-Click”installation, which lets the rider add or remove the 10+ from their bicycle in a snap. A built-in rear reflector is located on the backrest of the 10+, helping to alert others of the location of the bicycle. The 10+ comes equipped with an adjustable 3-point safety harness and 13 position adjustable footrests that include safety straps. With the 10+, parents will have peace of mind knowing that their little ones are safely enjoying their bike ride. COMBINATION LOCK - Includes a combination lock security system on the bracket to prevent theft. RECLINE - The backrest of the child bike seat can be reclined. ABS - Equipped with ABS (Automatic Barycenter System), which maintains the center of gravity in the correct position, regardless of the seat back angle. ADJUSTABLE FOOTRESTS - Fifteen position adjustable footrests lets the 10+ grow with child. PADDING - Constructed with thermoformed padding, which is water repellent and weather proof. Can be hand washed with soap and water. COLORS - Available in Black & White and Silver & Blue.